Nothing can brighten up your home like a splash of new color. Whether it’s a bright pastel or a deep hue, Shiver Lumber can custom mix, store, and match any color you can imagine. We have over 100 years of experience serving the professional and homeowner alike. We also carry a full line of Interior and Exterior Stains and Sealers. Let us help you beautify your home or project with a full line of paint and coatings from PPG, the largest coatings company in the world. Click here for more info, Digital Room Painter, and design ideas! We can match and record virtually any color from any manufacturer. 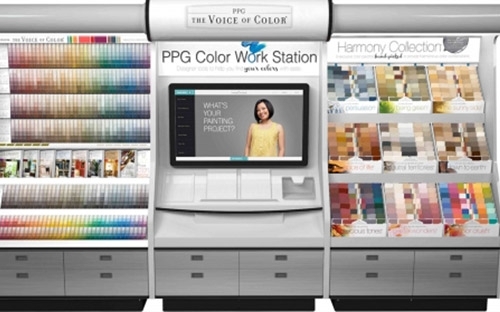 Bring your paint sample to our store for expert color matching. We record your color for future purchases so you do not have to worry about remembering next time you need paint. Our PPG oil and water base Stains are designed to penetrate deeply into wood pores enhancing the wood’s natural beauty and imparting a rich, even color. We also carry Sikkens, Ready Seal, Flood and Minwax and more. Call us today for our full line of Stains and sealers. Check out Orgill's catalog here! Top Paint & Stain Brands You Trust and We Carry!